Can Destination Madison help me find a hotel and/or facility for my meeting or convention? Yes! We provide a free lead service to help you locate facilities including guest rooms and meeting space. You can complete a simple form and submit your meeting information online, and a sales manager will contact you right away to work with you on finding the rooms and meeting space you need. You can also reach us by e-mail or by phone at 608.255.2537. Can Destination Madison help me book an off-site meeting/event/banquet? How do I obtain venue pricing and availability? We can forward your request for proposal to our partners that can accommodate your event requirements. Start your search using the tool on our facility search page; then submit an RFP. Our convention services team will contact you with any questions and to get the site selection process started. Each partner will submit individual pricing and availability since we do not provide this information. You may also wish to search our partner directory, which contains more than 500 listings including hotels, restaurants and other specialized facilities. How do I search for vendors and suppliers providing services and/or products for my meeting? Peruse our list of vendors, or let us do the legwork and submit a convention services RFP--we&apos;ll return information and bids on everything from entertainers to event decorators. What services can you provide to help me promote my meeting? Contact our Convention Services Team for more details about the promotional materials we can offer. You may also request a Visitors Guide, a bi-annual publication filled with information about our destination and partners. How do I obtain a welcome letter from Mayor Paul Soglin or arrange for him to address our group? How do I obtain a welcome letter from Governor Tony Evers or arrange for him to address our group? To request a letter of welcome for your attendees, signed by a Madison city official, simply e-mail our Convention Services Team with the name, date and type of meeting you&apos;re hosting. How can I find out what city events are taking place when our meeting takes place in Madison? Simply search our calendar of events by date, keyword or category; we&apos;ll serve up several options that are sure to help you make the most of your time in town. Where do I find statistics about Madison&apos;s tourism industry, visitor demographics and other information including public transportation, airport information and general facts? 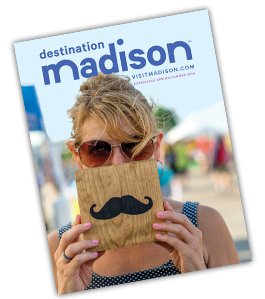 You can find Madison-area Facts and Data, plus the Destination Visioning report, on our Industry Research page. But there&apos;s more to explore in our media section, where you&apos;ll find fun facts that have put Madison on the map. For details on getting around town, visit our maps and transportation page. Do you have a listing of restaurants to try downtown? What would you recommend for fare outside of the Madison city limits? If you like to dine, you&apos;ll love our destination! Restaurants in the greater Madison area offer an eclectic mix of menus, from world famous burgers to continental cuisine and everything in between. Simply search our restaurant database by category, location or keyword to discover menus and more about each eatery. You can also find our restaurants by location using our Greater Madison and Downtown Madison restaurant maps. Do you provide a city information booth, restaurant reservation or registration assistance? We&apos;re thrilled to welcome visitors to Madison! Simply stop by any of our visitor centers at the airport and around town to find resources on where to stay, what to eat, tips on transportation and parking, access to area maps and more. If you are planning an event in the area, our staff can provide Registration and Visitor Information services at your event. E-mail our Convention Services Team for pricing and availability.